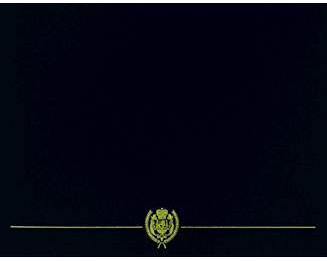 An unaltered photocopy of your DD-214, or WD AGO 53-55, Special or General Orders, or other military issued document clearly displaying your award of the Distinguished Service Cross . The Distinguished Service Cross has been in effect since April 6, 1917; however, under certain circumstances the Distinguished Service Cross may be awarded for services rendered prior to April 6, 1917 (see information provided under the Recognition of Merit). The Distinguished Service Cross was designed by First Lieutenant Andre Smith and modified by Captain Aymar Embury, both of the Camouflage Section, 40th Engineers, at Camp American University. Embury's final design was sculpted by John R. Sinnock of the Philadelphia Mint. The first awards of the Distinguished Service Cross were made on March 18, 1918, to three soldiers from the 1st Division: Second Lieutenant John Newport Greene of the 6th Field Artillery and to Sergeant William M. Norton and Private Patrick Walsh, both of Company I, 18th Infantry. The first style Distinguished Service Cross was struck in bronze and is one and seven-eighths inches in height and one and five-eighths inches wide. The suspender was originally part of the overall design of the medal; however, it proved unworkable and was replaced by a ball through which the suspension ring was passed. The central feature of the medal is an eagle centered on the cross over a four-pointed diamond outline with one point centered in each arm of the cross and with a five-pointed star at each point of the diamond. The eagle's wings are displayed and extend into the upper re-entrant angles of the cross. The arms of the cross are heavily decorated with oak leaves, and below the eagle in the lower re-entrant angles of the cross is a scroll bearing the inscription, E PLURIBUS UNUM. The eagle represents the bald eagle and symbolizes the United States. The five-pointed stars are taken from the United States flag and refer collectively to the United States, just as the inscription on the scroll refers to the fact that the United States is one nation composed of many states. The oak leaves stand for strength and courage. The inscription on the scroll is taken from the Great Seal of the United States and refers to the United States as one nation composed of many peoples. In the center of the cross is a rectangular plaque containing the inscription, FOR VALOR. The plaque rests on a circular wreath of laurel leaves in the center of which appears a decorative staff. The laurel wreath represents victory and achievement. Same as for the first style Distinguished Service Cross. 1. Description: A cross of bronze, 2 inches in height and 1 13/16 inches in width with an eagle on the center and a scroll below the eagle bearing the inscription "FOR VALOR". On the reverse side, the center of the cross is circled by a wreath with a space for engraving the name of the recipient. 2. Ribbon: The ribbon is 1 3/8 inches wide and consists of the following stripes: 1/8 inch Old Glory Red 67156; 1/16 inch White 67101; 1 inch Imperial Blue 67175; 1 1/16 inch White; and 1/8 inch Old Glory Red. 3. 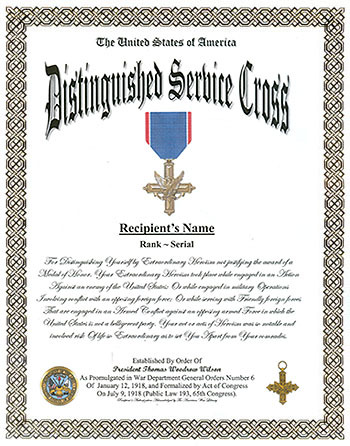 CRITERIA: The Distinguished Service Cross is awarded to a person who, while serving in any capacity with the Army, distinguishes himself or herself by extraordinary heroism not justifying the award of a Medal of Honor; while engaged in an action against an enemy of the Unites States; while engaged in military operations involving conflict with an opposing/foreign force; or while serving with friendly foreign forces engaged in an armed conflict against an opposing Armed Force in which the United States is not a belligerent party. The act or acts of heroism must have been so notable and have involved risk of life so extraordinary as to set the individual apart from his or her comrades. a. Decoration (regular size): MIL-D-3943/4. NSN 8455-00-269-5745 for decoration set. NSN 8455-00-246-3827 for individual replacement medal. b. Decoration (miniature size): MIL-D-3943/4. NSN 8455-00-996-50007.
c. Ribbon: MIL-R-11589/50. NSN 8455-00-252-9919.
d. Lapel Button (metal replica of ribbon bar): MIL-L-11484/1. NSN 8455-00-253-0808. 5. BACKGROUND: a. The Distinguished Service Cross was established by President Woodrow Wilson on January 2, 1918. General Pershing, Commander-in-Chief of the Expeditionary Forces in France, had recommended that recognition other than the Medal of Honor, be authorized for the Armed Forces of the United States for service rendered, in like manner, to that awarded by the European Armies. The request for establishment of the medal was forwarded from the Secretary of War to the President in a letter dated December 28, 1917. The Act of Congress establishing this award (193-65th Congress) dated July 9, 1918 is contained in Title 10 United States Code (USC) 3742. The establishment of the Distinguished Service Cross was promulgated in War Department General Order No. 6, dated January 12, 1918.
b. The first design of the Distinguished Service Cross was cast and manufactured by the United States Mint at Philadelphia. The die was cast from the approved design prepared by Lieutenant Aymar E. Embry, Engineers Officer Reserve Corps. Upon examination of the first medals struck at the Mint, it was considered advisable to make certain minor changes to add to the beauty and the attractiveness of the medal. Due to the importance of the time element involved in furnishing the decorations to General Pershing, one hundred of the medals were struck from the original design and numbered 1 to 100. These medals were furnished with the provision that these crosses be replaced when the supply of the second design was accomplished which would also be numbered 1 to 100.
c. Title 10, USC 3991, provides for a 10% increase in retired pay for enlisted personnel who have retired with more than 20 years of service if they have been awarded the Distinguished Service Cross.